What do I know about Love? The first and most essential “thing” to know and embrace is that love isn’t a thing! It’s it’s own entity. It’s alive and real and exists entirely apart from us. It’s a very tangible, personal, presence we can’t possess and that can only be given unconditionally! 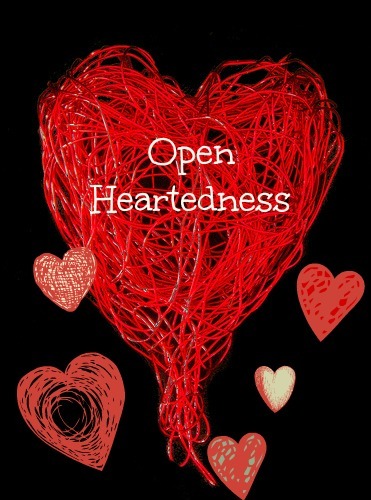 One that our hearts are either open and welcoming to or closed and isolated from. It’s ultimately powerful and imparts it’s strength to us acting as an agent of change in our lives for the better. Love can come to us through something as common as the “secret ingredient” in mom’s cooking. Or speak to us through the inner empathic voice we hear that says, “You were once like that!” It’s what makes a man rise up early smiling and eagerly head to work everyday! But love can also take us to some un-familiar places like “your knees” where you find yourself desperately praying to whatever god is listening for intercession on someone’s behalf. Love is divinely kind and wise and it shows us great respect in that even though it seeks to restore us in all ways it will only go where it’s invited or where doors are open. Love truly is all around us and how tragic it is that we can’t feel it because our hearts aren’t open! I think its under these difficult circumstances that love becomes creative and His methods most interesting. Working behind the scenes, choosing, Inhabiting and directing the necessary people and circumstances into peoples lives who’re destined to play a critical part in some cosmic “perfect storm” of revelation when we, as I did,sincerely request it! Actually I feel like what I did was to demand it. I needed a personally unavoidable demonstration not unlike what Paul experienced on the Damascus road. And while I certainly wasn’t blinded, as a result my viewpoint has definitely been changed! In short…I’d seen the sun in the sky with my eyes and understood with my intellect the laws governing the travel of its rays from there to here, but because I couldn’t constantly feel it’s warmth on my skin I called the whole thing into question. Of course I needed all this proof to occur despite my heart being closed, frozen solid and surrounded by glacial walls! Somehow I expected love to find me there hidden within the many tangled layers of impervious defense I’d built up over my life in response to the fear of pain…protecting and suffocating me all at once! It seems as though there are definitely times we can be our own greatest obstacle and I’m guessing that’s why it took so many years for all the components to come together. Not only in my life but also in the lives of all who were to be touched by what follows. And so it happened one perfect summer evening that love chose to act upon me through the simple smile of a young girl. I don’t recall any rapturous swooning moment or anything like that, only the gentle warmth that seemed to reach out to me and touch the cold place inside causing the first huge piece of ice to melt and fall off of my heart! It was an opening through which love could now move, one which also allowed me to feel again! And with these new feelings came an onslaught of new questions, the answers to which were always supplied by “love” as long as I chose to listen. It was in that moment, in my heart at least, that she became my daughter. It became my joy to give her whatever she might ask of me that wasn’t obviously harmful and to concern myself with her welfare. I also saw fit to provide a few unsolicited “wants” to her and her family who were seemingly struggling at the time. I don’t see it as being wrong in any way to love someone or to feel good about helping people but for someone like myself it can easily become a situation where it becomes a bit more about you than it is them and that’s kind of messed up. Do you realize that God The Father loves you that much? and SO much more! And despite everything He’s already done for you is still more than willing to meet you where you are…He’s also eager to show how much He loves you! And now that you know how it feels wont you at least give Him that chance? It’s quite unrealistic to expect a perfect love from ourselves or others because our “selves” are always going to get in the way! I have a tendency to not trust in love so I find myself looking for reasons to affirm that mistrust. I’m looking for a reason to reject others preemptively because I’m pretty sure that they’ll eventually reject me and I wanna be ready! I’ve found that if you focus on peoples imperfections and judge them for them instead of realizing the miracle it is that any of us can love at all you’re sure to reap what you sow! That evening, In just a single moment love showed me it’s perfect self and then left me at loose ends.. scrambling to somehow find a way to give back the perfect gift I’d been given. Its been a gradual change for me since then but day after day I can still feel the ice melt and fall off. I’ll always be in loves debt and I’m still looking to make good on that… The only difference is that now I understand it’s a debt I owe to everyone! I’ve found this to be quite a wonderfully humbling revelation! One which I’m happy to say is still in effect! Thinking that God loved me didn’t do me any good! It’s only when we start to really know how much He loves us and how passionate He is about being a part of our lives that we can begin to receive the good “things” He has for us and as a result be empowered to transcend all of the petty in comparison trappings of this life that are the source of so much despair! Treat yourself and have a listen to Sister Janis as she testifies!